All kinds of bread can be sliced. Machine with bag blower device for guick packaging. Wide selection of slice thickness from 8 to 30mm. 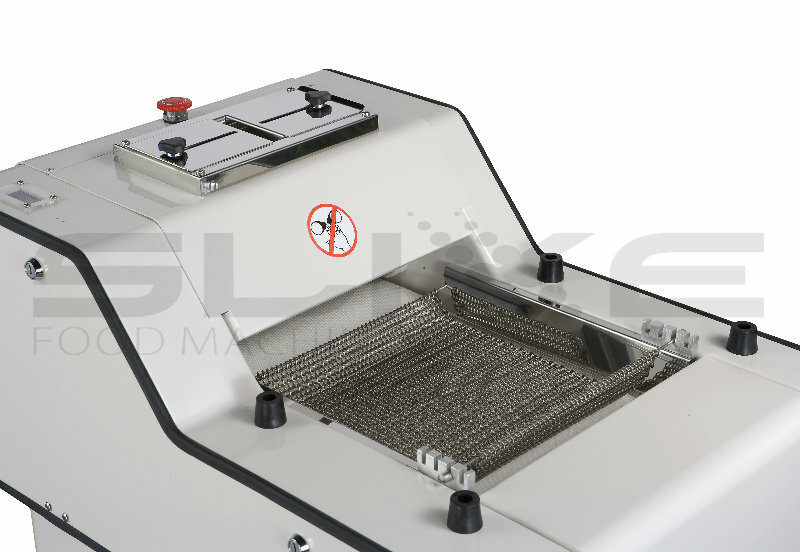 The bread slicer from TING AN Food Machinery (SLIXE) is normally designed to cut a loaf of bread into different thickness of slices quickly and precisely. This equipment is perfect for slicing a variety of breads such as soft or hard-rusted bread depending on your requirements. Purchasing our bread slicer will save your time with high efficiency and consistency so as to be widely applied for bakeries, restaurants, specialty sandwich stores, hotels, etc. 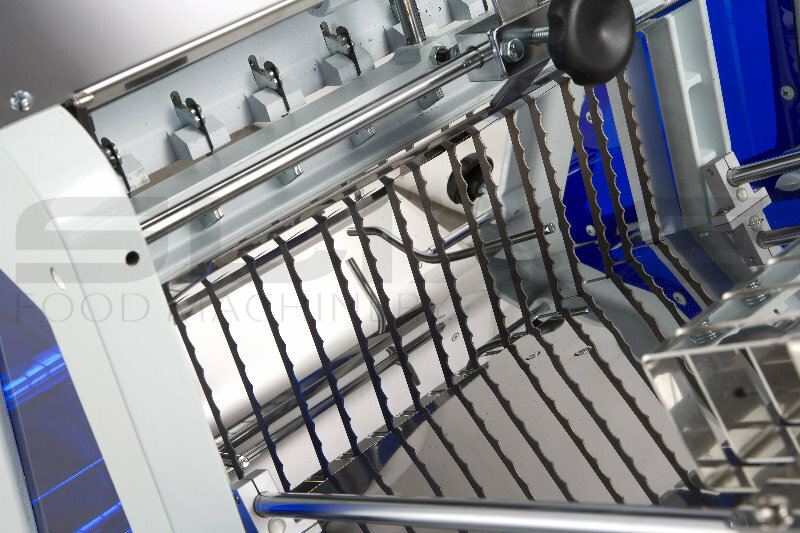 Looking for a slicing device combined with smaller space occupation yet durable and compact? Our bread slicer will be your desired selection. We have easy-to-replace, rust-resistance blades mounted in our slicer aiming to minimal maintenance. Further, it is simple to operate with push bottom control ideally prepared for sliced bread in no time. Hence, the machine meets the electrical materials requirements of CE and UL certificate. Established in Taiwan in 1991, TING AN Food Machinery (SLIXE) has been a specialized manufacturer of bakery machinery and bread slicer equipment in the baking industry for many years. Accordingly, we hear from worldwide customers to continue researching and producing the best products. A full array of bakery machineries are available in SLIXE for you to choose from. TING AN Food Machinery (SLIXE) offers eight kinds of baking products related to bread slicers that are designed to cut a loaf of bread or toast into many different thicknesses of slices. They are bread Slicer (TA-201S, TA-201L, and TA-201XL), bread slicer with pusher (TA-201L- P and TA-201XL- P), bread slicer with protection cover and pusher (TA-201L- PCP), bakery slicing blades, and bread slicer (piece by piece) (TA-202). Easy to replace the blade. We could offer custom-made thickness of slice. Machine meets the electrical materials requirements of CE and UL. The machine with Pusher can suitable for European breads and irregular shape of breads. Sliding rail install on Protection cover is patent product. Machine meets electrical materials and electrical safety requirement of CE. TING AN Food Machinery (SLIXE) is one of the leading manufacturers providing baking equipment in Taiwan and also offering the apparatuses to customers all over the world. The baking apparatuses made by TING AN Food Machinery (SLIXE) include automatic bread slicers, semi-automatic bread slicer, dough moulder machines, mini moulder machines, bakery slicing blades, and horizontal slicing blades. There are eight kinds of baking products related to bread slicers which are bread Slicer (TA-201S, TA-201L, and TA-201XL), bread slicer with pusher (TA-201L- P and TA-201XL- P), bread slicer with protection cover and pusher (TA-201L- PCP), bakery slicing blades, and bread slicer (piece by piece) (TA-202). The aim for bread slicers is to cut a long slice of bread or toast into small slices of different thickness. Can adjust the thickness of slice. Blade scraper can remove bread crumbs and fat. The dough moulder offered by Ting An Food Machinery (SLIXE) is specially designed to shape dough into versatile sizes of breads in the bakery industry. It is ideal for moulding dough to make rolls, buns, toasts, baguettes, loaves, etc. The roller system equipped in the dough mouldermachine can adjust depending on the size and hardness of dough and can make the dough structure more solid. In addition, the roller spacing and conveyor belt can be well adjusted by hand wheel. The dough moulder machine from Ting An is endeavoring to achieve high performance and high efficiency with several advantages. Basically, it is used for molding and discharging air from raw materials to obtain quality end products. Further, it has simple operation by switching on-off push bottom, as well as easily catching the dough with mobile steel tray both meet user-friendly demands for all clients. Ting An Food Machinery (SLIXE) has been an expert of bakery machine products and baking equipment over 20 years. Ting An dough molder features high speed so that it can save time and reduce labor cost. To make dough shaping operation and bakery making process smoothly and rapidly, our machines will optimize your product line and make your money back in short time. Please visit at our website www.ting-an.com and contact us directly. The machine can easy to operate and save time due to the same operating direction. Smaller space occupation and move freely. Conveyor belt can forward and reverse. Safety, Sanitary and easy to clean. The Bread Slicer Blades are the important link in the operation of machine so our experience and innovation create flawless bakery slicer blades worthy of our commitment to quality. Our Slicer Blades are made with a commitment to quality and innovation. Our quality assurance procedure makes sure our slicing edges meet the strict standards. The Bakery Slicing Blades are ideal for our Bread Slicer Machine and it can reduce the bread tearing and crumbing. We provide the customization of Blades. Welcome to contact us if you have any question about the Blades or Machines. TING AN Food Machinery (SLIXE) has been devoted to the manufacture of high-quality bakery machines since 1991 in Taichung, Taiwan. Currently, TING AN is the leading producer of bakery machines in the bakery industry, and has been offering the implements for domestic and overseas customers for many years. It is renowned for not only their high-quality bakery machines but also the reasonable prices. The bakery machines manufactured by TING AN Food Machinery (SLIXE) include automatic bread slicers, semi-automatic bread slicers, dough moulder machines, mini moulder machines, and the related accessories. The Horizontal Slicing Blades are ideal for Horizontal Slicer Machine. Our Horizontal Slicing Blades are made with a commitment to quality and innovation. Our quality assurance procedure makes sure our slicing edges meet the strict standards.